Black Friday is this week! Shopping craziness! We're giving away one of the season's hottest gifts from Crayola, the Color Explosion Glow Dome ! We were sent a fabulous box from Crayola through MyBlogSpark with a Crayola Color Explosion Glow Dome, the Crayola Glow Station, and Crayola Color Me a Song. I let my girls pick one of the toys to keep and we decided to give the other two toys away to families who need them. The Color Explosion Glow Dome is the one they picked and we have ALL had so much fun playing with this! We take turns picking a "theme". Then, one person colors the middle of the dome and another person colors the outside. 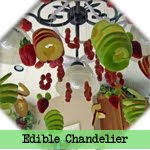 We put them together, choose a lights setting and watch it come to life. So much fun! 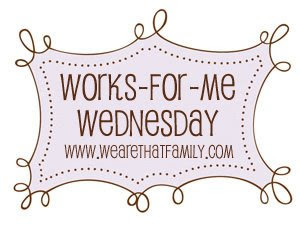 1) Leave a comment here telling me something you do to inspire creativity with your children/grandchildren/neices/nephews, etc. 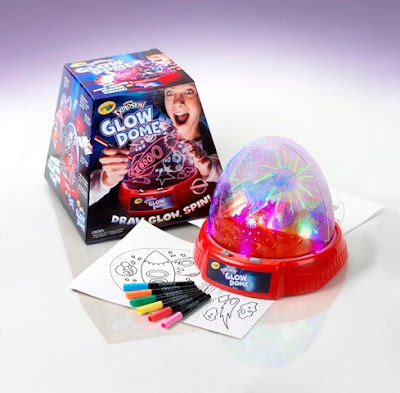 We'll pick one random winner on 11/29 to receive the Crayola Color Explosion Glow Dome. Now, that's my kind of shopping! ;) Open to US Residents. You can enter to win a 7-night Caribbean cruise for a family of 4 on Royal Caribbean's Oasis of the Seas. 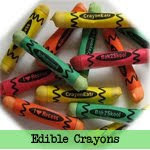 All you have to do is go here and create a Crayola wish list for your child. We did it together and the kids had fun! 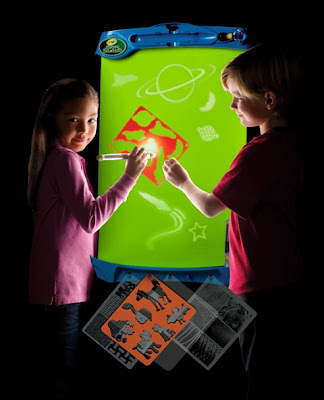 Crayola Glow Station illuminates children´s imaginations through the magic of drawing with light on a large-size glow-in-the-dark canvas. Using a light wand, children can either draw freehand or use stencils and texture sheets to create more realistic drawings. A diamond-shaped tip can be snapped on the end of the light wand for stamping unique starburst designs on the canvas. Drawings magically disappear over time, or can be "erased" by turning on the lights, so kids can create again and again for limitless fun. 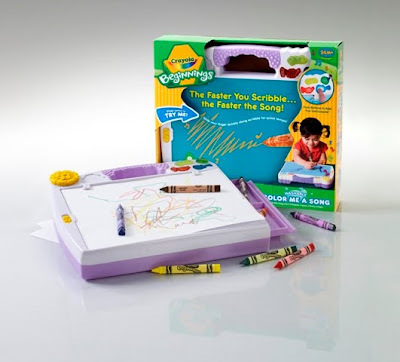 Crayola Beginnings Color Me A Song lets little ones draw to the beat of their own drum, trumpet, piano or guitar. This portable drawing and music creation station features a pressure-sensitive board that matches a melody to the artist´s pace. Draw fast, and the tempo picks up. Slow down, and so does the music. Four instrument buttons let kids pick their favorite sound. Color Me a Song was named a "Toy of the Year" by FamilyFun magazine and one of American Baby magazine´s picks for "Best Toys of the Year." Laura who said... When my 3 year old niece asks me to read to her sometimes I ask her to "tell me a story" and since she can't really read yet, she looks at the pictures and makes up some of the most amazing things. I just had a great conference call with two other foodie bloggers with Pat & Gina Neely from Down Home With the Neely's, one of my favorite Food Network shows! They were delightful! 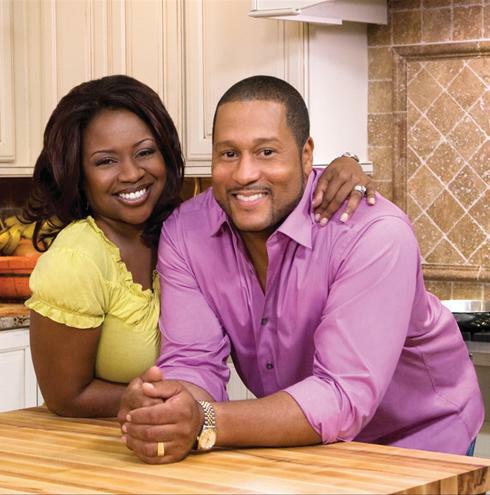 You can watch their Down Home With the Holidays ideas here.I asked them what are their "Go-To" recipes that people always ask for. Gina said it's her Collard Green & Artichoke Dip. Pat said it's his "Pat's Chili" recipe. Both are in their new cookbook--I just put it on my Christmas list! They have been busy doing some work with Sam's Club and they talked how much Sam's helped them out in the early stages of their restaurants--they bought a cash register there with their earnings from their first day (Pat was using a shoebox!). 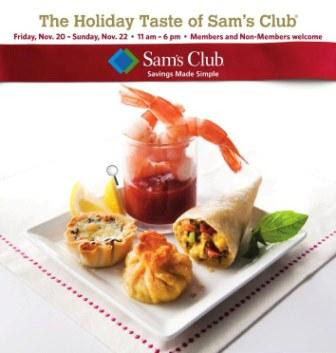 This weekend, you can go into Sam's Club for a fun Food Tasting and Holiday Ideas event! “The Taste of Sam’s” events are going on in Sam’s Club locations across the country this weekend, November 20 – 22 from 11 a.m. to 6 p.m.
We went yesterday and had a great time!! Miss C even suckered me into buying a birthday cake for her party this weekend--I have NEVER bought a birthday cake but it was so cute and only $11!! I figured it was cheaper than the time/ingredients it would take me to re-create it. All members and guests can walk into a Sam’s Club to see demonstrations for how to prepare Boneless Spiral Ham, Frenched Rack of Lamb as well as hand dipped chocolate desserts. 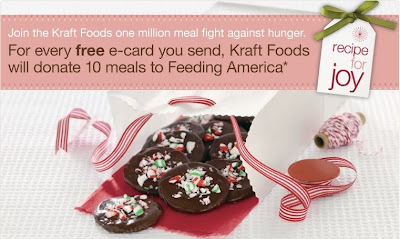 Associates will also be sharing recipe cards, and other samples and tips throughout the events, so it’s a good opportunity to learn more about Sam’s and get some ideas / inspiration for holiday meals. A fabulous French Bread that takes just over an hour from start to finish?! Yes, Virginia, there is a Santa Claus!... I am not the best at making homemade breads. I've tried zillions of recipes, some turn out part of the time, some are bad from the start. I FINALLY found a quick and easy recipe for french bread, I've made this multiple times in the last month and it's come out great every time. I even tried it at 9,000 feet in Colorado and it worked, there, too! Hallelujah! All you need is a mixer with a dough hook (I used my KitchenAid). I was sent this recipe (the pictures are my own) and I think it's from a blog, the writing is very "blog-ish"...I've tried googling it and searching for it, so if it's from you, please let me know! I want to give you a huge hug. Or, at least a link to your blog. :) Update: Hallelujah! After 4+ years, I think we finally found the source of this awesome recipe! It looks very similar to the one on Jamie Cooks it Up here. Thank you, Jamie! 1. Place the 1 C hot water in the microwave for 3 minutes to get it boiling. 3. Combine the salt, shortening, and sugar in the bottom of your mixer with a fork. The dough hook doesn't work very well. 7. Begin to add the flour, one cup at a time, until the dough pulls away from the side of your mixer...see the picture below. 8. Let the dough mix on high for 8 minutes. 10. Separate the dough into three parts and place on a large jelly roll pan sprayed with cooking spray. Let the dough sit for about 5 minutes. Letting it sit will make it MUCH easier to shape. 11. Spread the dough out as pictured below. 12. Then roll the dough up like this. 13. Then bring the ends over and layer them on top of each other. 14. Turn the loaf so the seam side is down. Repeat these steps with the other 2 parts of dough. 16. Make your egg wash by whisking the egg until frothy. 17. Cut three diagonal slits in the top of each loaf. Cover with the egg wash being sure to get it into all of the slits. 18. Place the loaves in a warm 170 degree oven and let rise for about 15 minutes. 19. Turn the oven up to 375 degrees for a convection oven, and 400 degrees for a regular oven. Leave the loaves in while the oven increases in temperature. 20. Bake for 10 minutes convection or 15 regular oven, or until the loaves are golden brown and crusty. 21. Turn the oven down to 325 for convection, 350 for regular and turn the pan around in the oven. Bake for another 7 minutes convection or 10 minutes for regular. My husband and I LOVE good clam chowder. And, we've had lots. LOTS. We've gobbled it in Boston, we've slurped it in Seattle. We've tried it overseas. But, believe it or not, my husband's very favorite clam chowder is actually from a restaurant in Salt Lake City, Utah called Market Street. Fortunately, they've been kind enough to share their famous chowder recipe. We had it tonight with some of our dearest friends (with the extra addition of some fresh lump crabmeat--oh my!) and I hope you can add it as one of your own family-favorite comfort foods! Enjoy! Combine melted butter and flour in oven-proof container and bake at 325° for 30 minutes. In large saucepan combine potatoes, celery, onions, green peppers, leeks, clams, clam juice, seasonings, Tabasco, sherry & water. Simmer until potatoes are thoroughly cooked. Stir butter-flour mixture into chowder and stir until thick. Mixture will be slightly less thick than cookie dough. Remove from heat. Stir in half & half until blended. Heat to serving temperature, stirring occasionally. Serve immediately. Serves 12. Whew! I'm officially done with Halloween until next year. 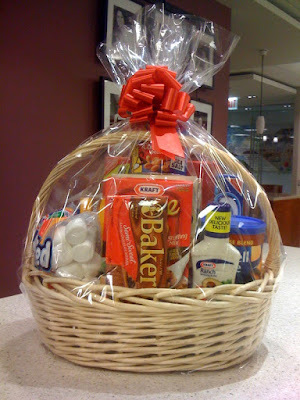 It was fun, but time to move onto bigger and better things...Holiday foods! 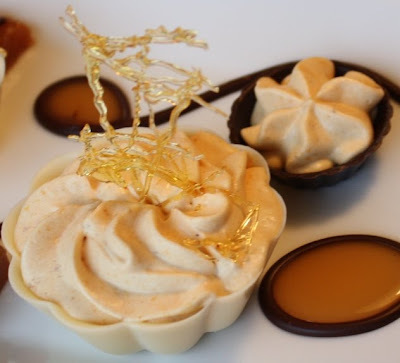 Here's an easy and elegant favorite: Pumpkin Mousse! ...maybe add some made-in-the-microwave salted caramels, a little belgian chocolate & caramel sauce? That's what I'm talkin' about! 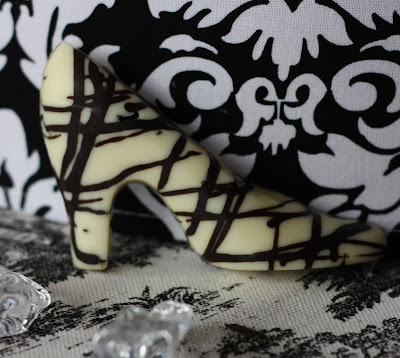 ;) The flavor combination of all these things is AMAZING, not to mention an impressive dessert for entertaining. 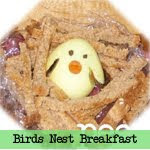 Combine egg yolks, 1 C. sugar and 3/4 C. cream in a medium saucepan. Cook over medium heat, stirring continuously, until mixture thickens and coats the spoon (8-10 minutes). Remove from heat and add pumpkin, spices and salt. Stir well and cool completely. 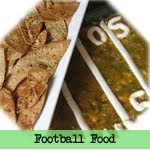 (You can speed up this process by putting it in the fridge or an ice bath). Whip remaining heavy cream and vanilla to soft peaks and fold into cooled pumpkin mixture. Serve in store-bought chocolate cups, or you can make your own easy chocolate balloon bowls. For the spun-sugar garnish, I made this recipe for microwave hard candy, drizzled it on a cookie sheet sprayed lightly with cooking spray, and broke it into pieces once hardened. To assemble dessert, put some melted chocolate into a ziploc baggie (I used Cacao Barry Dark Chocolate), snip off one end of bag and swirl on plate. When set, carefully spoon in a small amount of caramel sauce into several swirls. Add various cups of mousse and a couple salted caramels (recipe below). Melt butter in large microwave bowl. Stir in Karo syrup, both sugars and sweetened condensed milk. Mix until dissolved. Microwave on high 3-1/2 minutes. Stir down and scrape sides of bowl. Microwave on high 4 minutes. Stir in vanilla. Pour into buttered dish and refrigerate until set. When set, remove from fridge and cut into squares. Sprinkle a small amount of sea salt on each piece and drizzle chocolate on top (optional).